Wow. The Start menu is cool as #@!$. The only problems I have with it are that IE will not load the skin for some reason. I have WebBlinds set up to automatically use the current skin, and for some reason it won't skin IE. Also, I'd like to see some different schemes (brighter ones). Other than that, it's cool. Good job. I meant to say different "Color schemes". Scott: You can change the brightness of the skin with the new gamma controls in Display Properties (along with the colour changing). Not sure what's up with WebBlinds - here it loads the frame correctly but not the toolbar background. I'll talk to the developer about it. Great skin. It skinned IE6 at first, but now it's stopped - most weird. Not bad. However, if you look at the Style XP skin: XPmania's Longhorn v.4 you'll see what it should look like. Green, added the line and still no result. Having same problem with Alias, which is a UIS1 skin as well. sswhite: Should? This is a speculative UI. Until Blackcomb comes out, there is no "should". Juppy: Take a look and see if you've got WebBlinds loaded as well - it can have problems with UIS1. I'm seeing white text in more that just IE. Is there anything I can do to fix this? Not a huge amount, unfortunately. Sometimes application developers get their colours mixed up (say, they use the button text colour when they should use the window text colour), and it doesn't show until you do something like leaving window text black but changing button text to white. If you are using Blackcomb, you could try overriding the Button Text colour in WB's Advanced option dialog, setting it to black. This may cause problems elsewhere, though - but it's worth a shot. Hey man. Love the skin man. Works awesome with no problems. I need somethin' from you though. 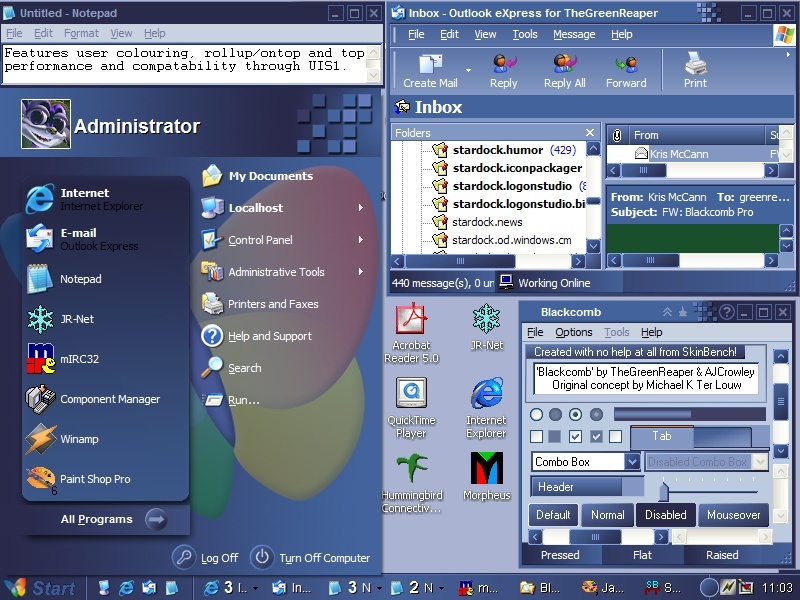 Can you hook me, or us, up with a WinXP Logon Theme to go with this? It would be killer. Whenever you get time, please take a shot at it!! For all those running non-XP versions of Windows, there is now an Blackcomb ObjectBar skin at http://www.wincustomize.com/skins.asp?library=4&SkinID=141 - enjoy! Reaper - yes, I am running WebBlinds. However it seems to have settled down now - it was a few weeks ago and I can't remember what I did to fix it! Thanks for the feedback, though. Still using (and loving) the skin, though it seems a bit slow. Could be the on-board graphics on this (work) PC though, as it seems faster at home on my GF3-equipped machine. Quite likely. The graphics subsystem plays a *big* part in WB performance. But, really, I use this skin every day. Nice, clean, skin that doesn't hurt my eyes to look at all day. I love the ObjectBar skin, too. Great work!